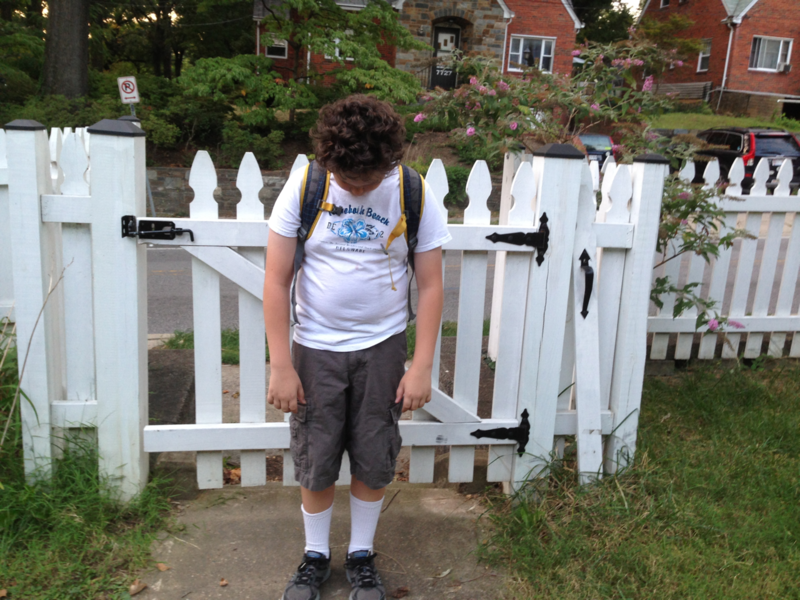 This is the first school year in a long time that neither kid is starting a new school. 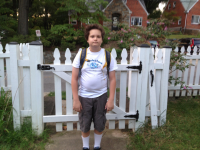 A year ago Noah started middle school, two years ago June was starting kindergarten, and three years ago Noah was switching from his home elementary school to a magnet gifted program. So starting second and seventh grade is almost anti-climactic, but in a good way, a settling-back-into-familiar-routines kind of way. We got the postcard with June’s classroom assignments on the Wednesday before school started. She has Señora J in the morning and Ms. K in the afternoon. Señora J has the reputation for being a little stern, but fair and challenging. I think she and June will get along fine. I’d never heard of Ms. K. and I wasn’t sure if she was new or not. It’s a big school outside the school-within-a-school of the Spanish immersion program and I haven’t heard of all the teachers. As it turns out, she is new. This made me just slightly nervous because the year Noah had two new teachers (third grade) was his most academically unsatisfying year. And I don’t think June was sufficiently challenged last year, especially by her English teacher, though June was quite fond of her. 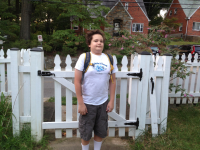 As for Noah, seventh grade is reported to be the most rigorous year in the Humanities magnet. They write a ten-page research paper, researched in part at a university library. It will be taxing at times, no doubt, but I’ve also heard it’s the year they really learn how to write and that kids who come out of the magnet program find themselves better prepared for advanced classes in high school than their peers. So I think it will be worth it. All summer I had a printout of my summer work schedule taped to the wall of the study. It had the dates for each of the ten weeks of the kids’ summer break and how many hours I committed to work during each of them. I checked the weeks off one by one as they passed. For most of the summer I did this with a sense of satisfaction, as I looked forward to getting back to a more predictable routine and a quieter house. But after we returned from our West Virginia/Ohio trip and there were only two weeks left on the makeshift calendar, I started to think, “Only two more weeks?” and I resolved to do more fun things with the kids before summer break was gone. The second to last week of summer break both kids were home. They had to do summer homework (and they both all but finished it) and practice their instruments, and Noah mowed the backyard, but we also went wading in the creek, went to see a documentary about cheetahs and lions, went out to lunch and out for ice cream and frozen yogurt. I took June to a drop-in music class and to the library for Spanish circle time. June had a friend over and they organized a picnic and a tea party and played dress up while I worked. On Friday we were planning a trip to the pool but then I found out the pool I had in mind, the only outdoor public pool in walking distance of our house, is closed on Fridays, so June and I went to the playground and she waded in the creek again and then we went to the 7-11 to get milk and we ended up with snacks as well. As I watched her ride her bike home one-handed while eating Cheetos out a bag in the basket I came to the conclusion that it really is time to take off her training wheels. When we got home, Noah had finished all the items on his to-do list so I made some iced tea and we played one board game of each kid’s choice. June chose Operation; Noah chose Quirkle. It was nice to have the time to play a long game all the way to the end and not feel rushed. Over the weekend, I made a peach-blackberry cobbler, we went thrift store shopping for school clothes and Noah and June organized an art show. (The art was all June’s but Noah made the poster for it.) It was originally conceived as a money-making venture, but we told June she couldn’t charge money for admission or artwork. We also limited the guests to kids who live on our block, a group consisting of two families with three kids each. One family was out of town, but the other came, as did a retired colleague of Beth’s who saw the poster Beth put on Facebook. 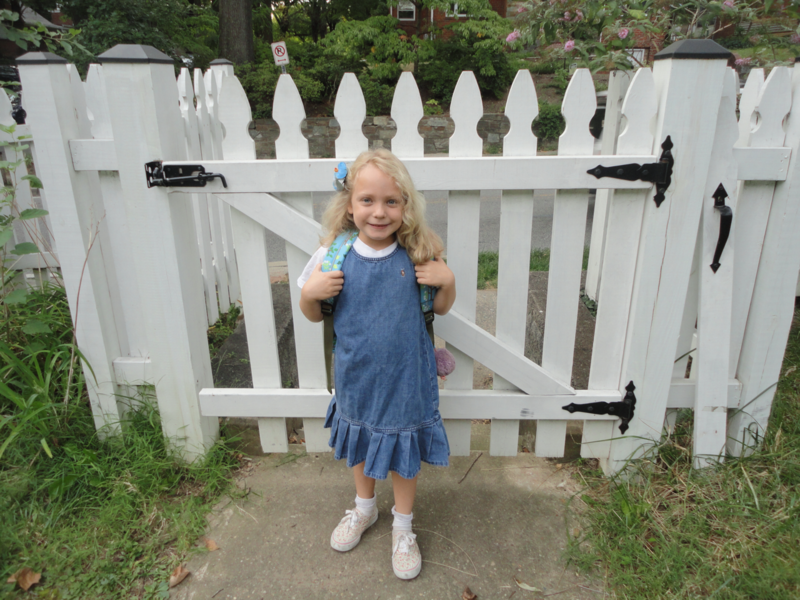 June proclaimed the show a success before it even happened, because we bought her a summery party dress for it, even though we went into the store saying words like “practical” and “school clothes.” (Things like this have a way of happening around June.) Anyway, June got to walk people through the artwork twice, get complimented on it, serve lemonade and cookies, and wear a new dress. She was satisfied, even without profits. The next week Noah had drama camp. I was glad because it forced him to complete his summer homework the week before and just have a nice relaxing final week of summer. June and I were left to our own devices. So I arranged for a couple play dates (including a double play date that started with me taking June and Megan to Spanish circle time, having a picnic lunch with them and then dropping them at Megan’s house for several hours). After an animated discussion about the existence of fairies during her other play date–consensus: they are real–June told me last year there was a kid on the school bus who said the Tooth Fairy is just your parents. And then she looked me right in the eye and said, “Is it you?” So I had to tell her. (Actually, I made Beth do it.) It was not the answer she was expecting, and I was sorry about it because she’s only lost two teeth. But for us, when it gets to the point of direct questions, it starts to feel less like pretending and more like lying, so it was time. There were no follow up questions about Santa and the Easter Bunny. If she doesn’t ask, we won’t tell. 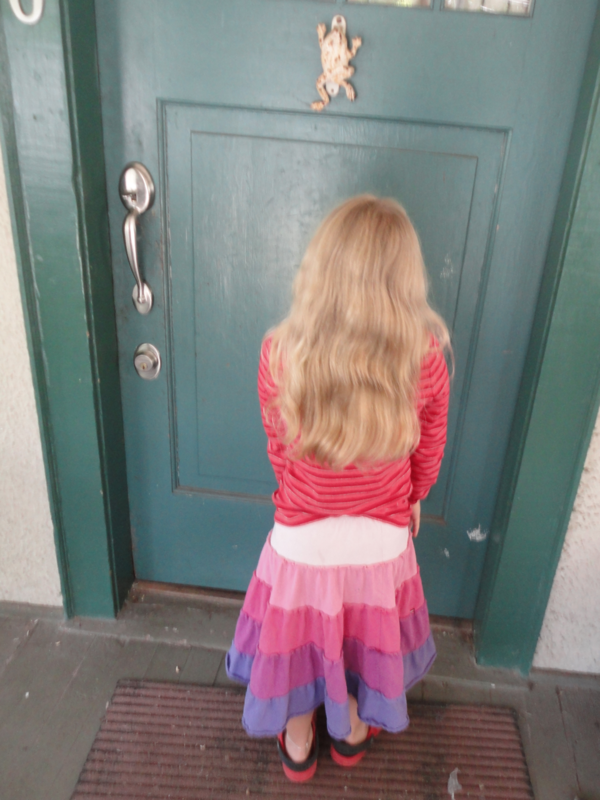 She may be starting a new school year, but I’d like to let her enjoy as much magic and innocence as she wants for now. That week June and I also made chocolate-covered frozen bananas and “back to school” cupcakes, with the initials of the kids’ schools on them, went to Co-op story time, which we hadn’t done all summer, and finally made it to the pool. On the way home from the pool I walked along the creek and June walked in it (because it would be a waste of being in her bathing suit if she didn’t, she explained). Usually we could see each other, but sometimes the undergrowth was so thick we couldn’t. Then I could hear June splashing along beside me, singing an impromptu song about walking in the creek and muttering to herself, “Mommy knows where you are.” It was just the right amount of adventure. Friday June went to work with Beth in the morning and then they both came home mid-day for the Open House at June’s school and Noah’s drama camp performance. June was so excited to meet her teachers and see her friends at the Open House she kept bouncing up and down on her toes. To our surprise, we discovered we know Ms. K, she’s the mother of one of Noah’s old classmates (and by a strange coincidence, so is Señora J, but we knew that already). Ms. K has three kids who’ve attended June’s school (one’s in high school now, one’s in Noah’s grade and the youngest is in June’s grade). This eased my mind because it meant while new to the school as a teacher, she was not really new and knowing something about the school’s culture will probably help her land on her feet. Between the Open House and Noah’s performance we ran some errands. We dropped off Beth’s Birkenstocks and mine to be re-soled and re-corked, and went to a bookstore to buy the fall book for my book club. We’re reading Remembrance of Things Past, or the first couple volumes of it. I decided to start reading it on the first day of school. It seems like a good day to start a serious book. At Noah’s performance, he was in two improv sketches, one in which he was called on to be the “world’s worst cobbler” and the “world’s worst doctor” (I called out “cobbler” when the audience was asked to name a profession, probably because we’d just taken our shoes for repair) and another one called “Poison Arm Samurai” in which thirty ten-to-thirteen-year-old-kids stumbled around the stage in zombie-like slow motion slaying each other by brushing their arms up against each other. It was like a very strange dance. After the performance we let June play in the fountain, but she didn’t stay long as it was cool and drizzling. “The summer is really winding down,” Beth commented as we watched her run and splash. What really made it feel that way for me, though, was some time the next day when I sat down at the computer to check my email and noticed the calendar on the wall. I grabbed a pencil and checked off the line that said, “August 19-23: 7.5 hours.” Then realizing there was no reason to keep it, I made a move to pull it off the wall and found myself reluctant to do so. Then we were down to the last weekend. On Saturday, Noah went over to David’s house, and June went to Talia’s birthday pool party. Both kids got haircuts on Sunday. It was the most hair June’s ever had cut off at once, probably three or four inches. She wanted it shorter for second grade, and even though I’ve always like her hair long, I said yes, because she’s seven and I need to let her make more of her own decisions. I actually expected her to come home with shorter hair than she did. It’s a couple inches past her shoulders still. This next morning Beth and Noah were out the door by 6:40 and June was ready to go by 7:35, a good forty-five minutes before she needed to. At the bus stop we greeted families we haven’t seen in a while and met the one-month old brother of a third-grader I’ve known since he and June were toddlers waiting at their older brothers’ bus stops. 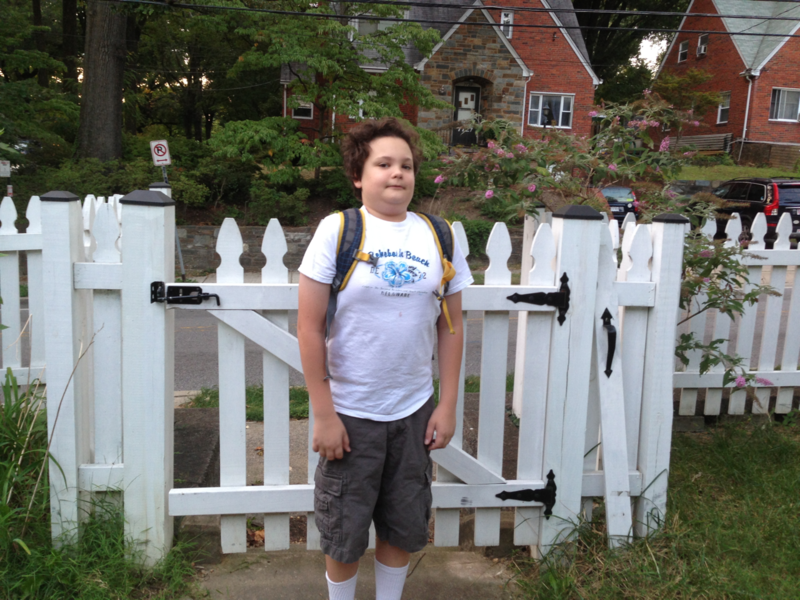 Last year’s fifth-graders were gone and everyone is a year older. Funny how that happens. The kids came home with no homework in June’s case and minimal homework in Noah’s case. They shared their news at dinner. There was a glitch in Noah’s schedule and he wasn’t signed up for band. (This was resolved on the second day of school.) 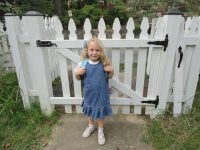 There are new restrictions on when middle schoolers can visit their lockers (hardly ever) and new rules about where the kids at June’s school can play during recess, and breakfast is now served in the classroom instead of in the cafeteria at her school. Otherwise, not much is different. We ate the leftover ice cream and the kids went to bed, another school year underway.